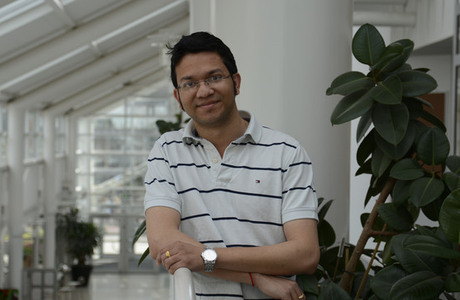 We would like to congratulate Soumitra Chowdhury who, at September 28, successfully defended his PhD thesis in Informatics, receiving his doctoral degree. Soumitra Chowdhury has in his research studied digital service innovation in the transportation sector. Today, vehicle manufacturers provide digital services related to safety and security, such as remote monitoring, roadside assistance in case of emergency and stolen vehicle identification. But in order to have effective, efficient and safe transportation, digitalised product platforms need to develop and include a larger range of services, for example remote diagnostics services (RDS). By using technologies for remote vehicle monitoring, diagnosis and prediction of faults, RDS can be designed for better vehicle maintenance and operation. This can benefit the transportation business as well as our society as a whole. – One interesting and crucial finding in my research is the strategic value of data generated from the usage of digitalised vehicles. As the data is remotely transferred to vehicle manufacturing firms, the firms can use the data to design and offer services related to vehicle maintenance. In this way, manufacturing firms can become more customer-oriented which is an aim for the firms to sustain in business, explains Soumitra Chowdhury. To read more about Soumitras work you can also check out the blogpost called Present your work. Part 1: Soumitra Chowdhury, in which Soumitra present his studies.